Kansas City, MO Nov. 6, 2017 – A small grasshopper embedded for more than a century in the thick paint of Vincent van Gogh’s Olive Trees was discovered as part of research for a catalogue of the French painting collection at The Nelson-Atkins Museum of Art in Kansas City. The discovery is just one of the exciting results that emerged as scientific study and art historical research were combined at the museum to better understand the artist’s process. The new findings are part of work by skilled curators, conservators and outside scientists who are adding to the scholarship on 104 French paintings and pastels at the Nelson-Atkins. The resulting online catalogue will be published in installments beginning in 2019 and will be a definitive resource that offers extended entries for core works, including Olive Trees. The team contacted paleo-entomologist Dr. Michael S. Engel, Senior Curator and Professor, University of Kansas and Associate, American Museum of Natural History in New York, for further study. 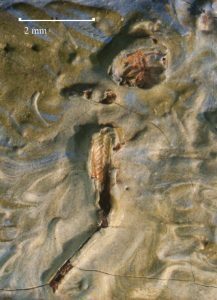 Engel observed that the thorax and abdomen of the grasshopper were missing and that no sign of movement was evident in the surrounding paint, indicating that the insect was dead before landing on van Gogh’s canvas. The grasshopper could not be used for more precise dating of the painting. While the grasshopper becomes an engaging topic for museum visitors, more significant research on Olive Trees is underway. Analysis by Mellon Science Advisor John Twilley confirms that van Gogh used a type of red pigment that gradually faded over time. These findings suggest that areas where van Gogh employed this red, either alone or mixed with other colors, appear slightly different today than when the painting was completed. The artist’s letters often referred to his works by their dominant colors, which means the more recent changes in appearance can present uncertainty as to which painting van Gogh alluded to in his descriptions. With funding through the museum’s Andrew W. Mellon Endowment for Scientific Research in Conservation, more research is being conducted to evaluate the impact of these color shifts. 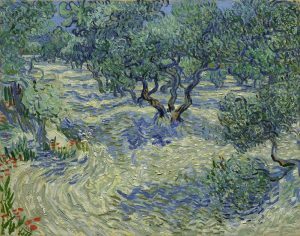 The research is expected to clarify the original appearance of Olive Trees and to offer a clearer understanding of its place within van Gogh’s series of works on this theme. Vincent van Gogh (Dutch, 1853 – 1890). Olive Trees.1889. Oil on canvas. Dimensions: Unframed: 28 3/4 x 36 1/4 inches (73.03 x 92.08 cm). Framed: 37 3/4 x 45 1/2 x 2 inches (95.89 x 115.57 x 5.08 cm). Purchase: William Rockhill Nelson Trust. 32-2.